Faith: Peonies...to pick...or not to pick? Peonies...to pick...or not to pick? 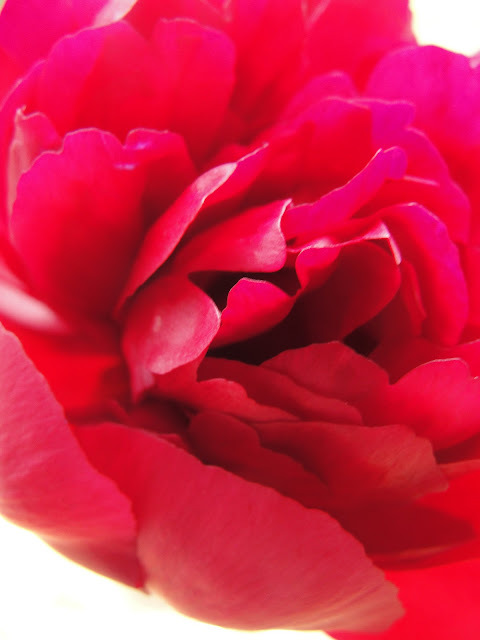 I was reading Little Macaroon's most recent post a few moments ago, and wowing at her photos of a visit to London where she had seen peonies en masse....gorgeous! I was just commenting that my peony in the garden, had always failed to produce anything more than just leaves, and then remembered when taking a wander around the garden the other day (the type of wander where you pretend not to notice all that needs doing) I spotted a bud....just the one, but a bud indeed! Anyway, looking up from the ipad whilst commenting on the lovely photos, I spotted a splash of red in among all the weeds wildlife area of the garden, so I finished writing my comment and then went to go see, but as I looked out of the kitchen window, it was gone! Now explain that one would you? The thing is, I also tend to feel a little overwhelmed by it all, which rather than motivate, puts me into 'stop-mode' and then it all gets positively jungle-ous. But......there are some things which just happen in their own miraculous way inspite of my gardening skills! Aww thats so cute. I think I would have picked it too! its just so beautiful. 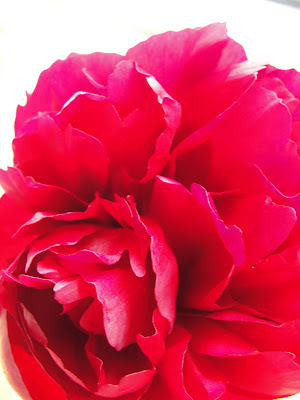 So we had a lovely peony plant in our old garden which had the most beautiful leaves, but did bugger all else. We moved to our new house a couple of years ago and transplanted said peony which still did bugger all. Until this year, when it has burst into life and produced the most brilliant and beautiful white flower. I did pick it. It was worth looking at for a few days, I can tell you! Incidentally, it has produced no other flower buds since. Oh this is so beautiful!! What a sweetie!!! I love that he found this peony and wanted to share it with you ... even if it meant bringing the peony indoors rather than YOU outdoors. It's a beauty, by the way, and take a note from me: if you spend 30 minutes each day in your garden working on one very small piece, you'll be amazed at how different you will feel about your garden after only a week. Like most things, I try to take small bites rather than look at the whole plate! Oh, how precious he must be. I too am a "lazy gardener" and I'm glad you put a name to it and I too get overwhelmed with things and then just stop doing any of it which of course is not the best plan of action. 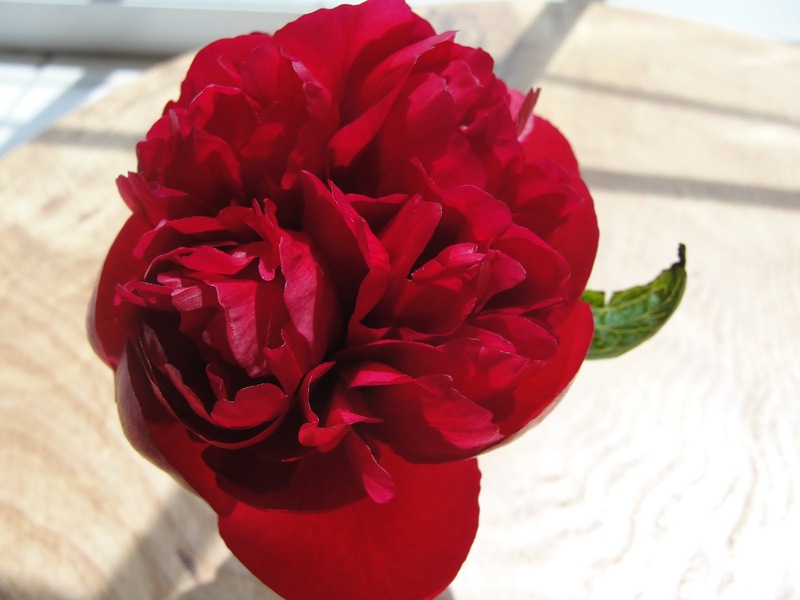 I have one peony that I planted 7years ago and I get one bloom per year except this year I got none. Could it be that it is in the middle of a weed patch? Yours is gorgeous and I love their smell. Maybe I just need to buy more and plant many? I love peonies! I love them in the pale pink, they look so charming in a vase. I get why your boy picked it haha. What a lovely post. And what a very special little boy you have there. Year of projects and a 100th post giveaway!